At Byemould we are big fans (no pun intended) of the EcoAir dehumidifier range and have covered the features of the EcoAir DD122FW, EcoAirDD122MK5 and other EcoAir dehumidifiers in-depth. The EcoAir DC12 Dehumidifier is a modern looking machine which is solidly build and the 4.7 / 5 rating on Amazon echoes our sentiment of this great little unit. The EcoAir DC12’s larger brother (or sister!) is the splendid EcoAir DC18 dehumidifier. Both of these dehumidifiers are compressor dehumidifiers so the actual extraction rate will probably be less than half of the stated 12 litre and 18 litre rates. Don’t worry, this variance is perfectly normal for compressor dehumidifiers as explained below. But first let’s have a look at the pros and cons of the EcoAir DC12 compressor dehumidifier. As its name implies the EcoAir DC12 can extract up to 12 litres per day. As per usual however you will find that the extraction rate is probably much lower in the UK. This is because the 12 litre daily extraction rate was tested in a temperature of 30C and 80% relative humidity. That’s the sort of weather we pay good money to go on holiday for! It is worth mentioning again that if you have not used a dehumidifier before you should run the machine on a high setting for the first few days or weeks (depending on how wet your area is) before running the dehumidifier on its standard setting. The extraction rate initially will be higher than normal as there is a lot of moisture in the air (probably more than you think). Once the humidity level reaches around 55% you will probably extract around 4-5 litres per day (again, depending on conditions). For a larger extraction of up to 18 litres per day you may also like the EcoAir DC18 dehumidifier. The DC18 is the same dehumidifier as the DC12 but with larger specs. The filter is a standard dust filter which is located at the rear of the machine. 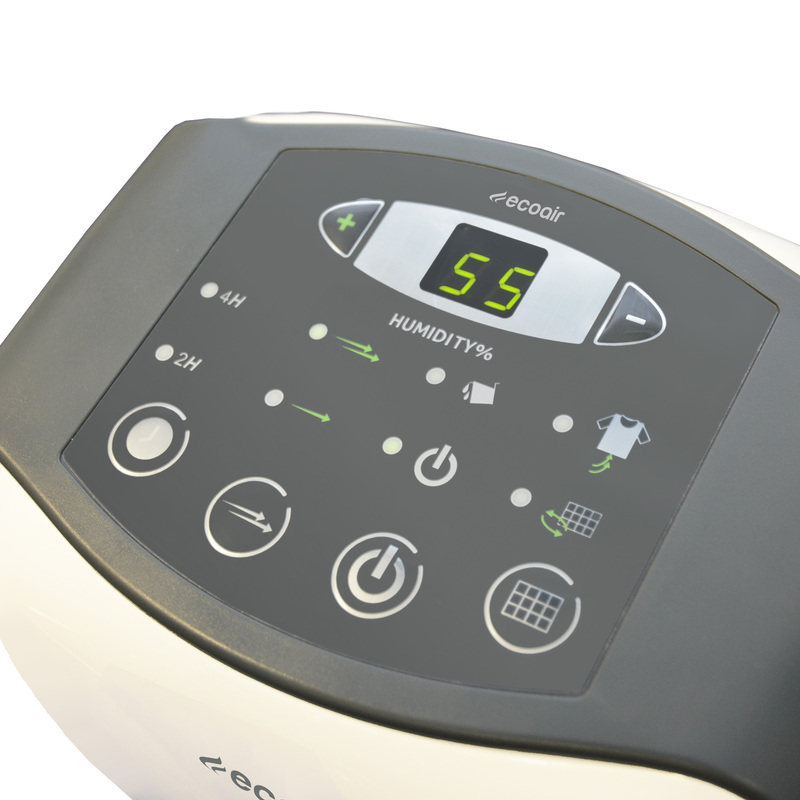 If you suffer from respiratory problems and allergies such as hay fever then I would recommend the EcoAir DD122 MK5 Desiccant Dehumidifier which features a silver nano, anti-bacterial filter as well as an ioniser. As with all dehumidifier filters regular cleaning is necessary. A great feature of the EcoAir DC12 is the ‘Filter Clean’ indication sensor and display which lets you know exactly when to clean the filter. This is a feature that is not typically found on dehumidifiers. The water tank holds 3.5 litres of gray water. This makes the tank large for domestic purposes and, perhaps, a little more awkward to handle, when full, than a standard 2 litre tank. However the tank is well designed and has a single water ‘in’/’out’ hole. As is standard the dehumidifier automatically switches ‘off’ when the tank is full. The EcoAir DC12 also features a ‘tank full’ indicator so that you know when to empty the tank. The EcoAir DC12 has a continuous drainage option which is great for caravans, garages and the like. The drainage hose is included so does not have to be purchased separately. The rear of the dehumidifier also features two hooks onto which you can neatly wrap the cable and plug when the dehumidifier is not in use. This power cord hanger is located about half way down the dehumidifier and it is at this level that the continual drainage plug is also found. Compressor dehumidifiers typically weigh more than desiccant dehumidifiers and the EcoAir DC12 is no exception. Whereas the other EcoAir dehumidifiers reviewed on Byemould.com, the EcoAir DD122FW and the EcoAir DD122MK5, are desiccant dehumidifiers weighing only 6kg, the EcoAir DC12 weighs in at 11kg. Luckily EcoAir have kept an eye on the weight of this dehumidifier and have included a set of concealed castor wheels for ease of movement when cleaning it or just for moving it into a different room. Another feature that I quite like is the timer function. With the timer function you can ‘set and forget’ which is very useful for myself as I often use a dehumidifier in my rental properties when in between tenants. Another great domestic use for the timer is when using the EcoAir DC12 in laundry mode. The timer settings are for 2 & 4 hours although I personally prefer to see an 8 hour button as well. The EcoAir DC12 features two fans which give the option of normal operating mode with efficiency and quietness or the laundry mode which is when the dehumidifier works flat out until the operator stops it. As the name implies this is handy for drying clothes indoors. There is also an automatic restart function. This means that in case of a power cut, or if the plug accidently gets pulled out of the socket, the dehumidifier will automatically restart in the setting that it was left in, once the power is reconnected. The EcoAir DC12 measures 22.5 deep x 49.6 high x 35.3cm wide which is a typical size for a compressor dehumidifier. It runs at just 230 Watts which makes it fairly cheap to run. The soft touch electronic control panel looks fab although you may need to peruse the instructions before using it. One feature of the control panel that I really like is the digital relative humidity (RH) reading which is something that my favourite dehumidifier, the Meaco DD8L, does not have. You can read the actual RH level of the room which is much better than dehumidifiers which only have a one, two or three droplet setting as, in those circumstances, you really have no idea what the room’s RH level is. Also you can set the relative humidity level that you prefer as the settings range from 35% to 80% in 5% increments. This range of RH is very suitable for UK weather conditions. Underneath the RH level setting display, on the left, you have a timer button suitable for 2 or 4 hours. To the right of this you have the fan speed button. Next you find the ‘on’/’off’ button with the ‘tank full’ light above this. Finally, on the right hand side of the control panel, you find a button to press once you have cleaned or changed the air filter. The ‘laundry mode’ is found by pressing the – button until it says ‘CO’, for ‘continuous operation’ on the screen. The EcoAir DC12 outputs around 42dB, at its lowest setting, which is at the low end for a compressor dehumidifier. The EcoAir DD122FW and EcoAir DD122MK5 desiccant models ouput 36dB in their lowest settings. Desiccant dehumidifiers are quieter than their compressor counterparts. The EcoAir DC12 comes with a 2 year manufacturers warranty. The EcoAir DC12 rates a very good 4.5 / 5 stars from 160 reviews on Amazon. We hope that you enjoyed this EcoAir dehumidifier review. Let us know your thoughts in the comments below. EcoAir DC12 or EcoAir DD122FW Dehumidifier?